Welcome to the Veteran Phil Stories page. Veteran Phil is 95 years old. He fought on the frontlines in WWII. He doesn’t want to talk about his war experience as he still has nightmares about it. I created Veteran Phil to honour our Canadian veterans. We owe them so much. Without them, we would not have the freedom we enjoy today. If you like stories about veterans, Remembrance Day and bravery, you will like stories about Veteran Phil. There are stories about people honoring Veteran Phil for his services to our country and remembering him for what he did for us. There are stories about how Veteran Phil is a very humble, kind and considerate man. Storyland has lots of stories about Veteran Phil that you can read, like and share. There are no new Veteran Phil stories at the moment. 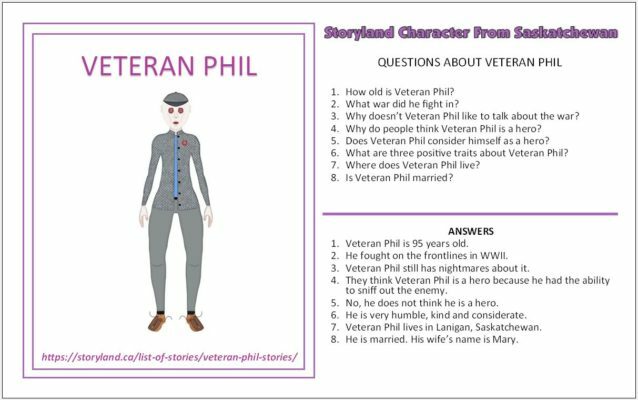 To learn more about Veteran Phil, collect Storyland Trading Cards and you might just get a Veteran Phil card. Veteran Phil fought in the frontlines of World War II. He is a very humble character on Storyland. He is part of the Saskatchewan Series – Storyland Trading Cards.